A significant outbreak of measles in Bristol has prompted new warnings from Public Health England. So far in 2018 there have been 56 confirmed and 24 probable cases in the city compared with just one during the same period last year. There were 643 confirmed cases of measles across England in the first six months of the year, compared with just 267 in the whole of last year. Health officials say it is part of a rise across Europe. She said: "There has been, just this year, thousands of cases in countries like Romania, France, Italy and Greece. "People travel all over and bring measles back with them and so the cases that we're seeing are very much in young people and adults over the age of 15 who've missed out on their MMR vaccine when they were younger. "So we're getting cases brought back from Europe and then with some limited spread in the community." Cases increased four-fold, with more than 20,000 people affected and 35 deaths. People shunning vaccination is part of the problem, say experts. Although research published 20 years ago about a possible link between the MMR vaccine and autism has been discredited, the scare it created damaged some people's trust of the vaccine. 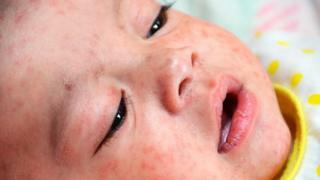 Measles is a highly infectious viral illness that can be deadly. The MMR vaccine can prevent it.